Liberty Science Center President Paul Hoffman poses with two Mandalorian warriors, a Jedi knight and R2-D2 at "Science, Sabers & Star Wars," a special event that will run Feb.12 – Feb.15. JERSEY CITY, N.J. — The Force is strong at Liberty Science Center this Presidents Day weekend. "Star Wars" remixes and tribute songs filled the air as crowds of dressed-up fans and their parents (and children) packed into the learning center in New Jersey Friday to kick off "Science, Sabers and Star Wars," a celebration of the movies' world. "We're able to marry something people like anyway — and, of course, that's their enthusiasm for 'Star Wars' — with actually going a bit into the science behind it," Paul Hoffman, Liberty Science Center president and CEO, told Space.com. "We need[ed] activities that have science in them, we need ones that we can move lots of people through, we need ones that will be interesting for the spectators even though they're not doing it — it's fun to see people try to shoot down the Death Star, or fly a drone." Visitors pose with R2-D2 Feb.12 at Liberty Science Center's "Science, Sabers & Star Wars" event. "It's good seeing adults smile, […] reliving their childhood," one of the Mandalorians told Space.com. He's a part of the Mandalorian Mercs — a group who wears homemade costumes to events to raise funds for children's charities. Stormtroopers from the 501st Legion and Jedi from Empire Saber Guild — similar charity organizations — join the Mercs on the floor. "The younger children, they just light up — when they're not running away," he added. Newly certified Jedi knights pose at Liberty Science Center Feb. 12. 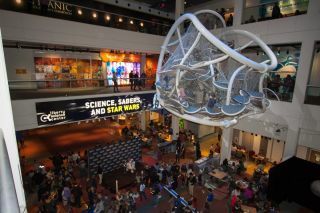 Liberty Science Center visitors bring balance to the Force at "Science, Sabers & Star Wars." Hoffman estimated at least 10,000 people will make their way through the exhibits and special "Star Wars" activities over the course of the weekend. "That's what's fun about it," he said. "It really is a party, and to be able to celebrate with people that have the same enthusiasms you do, in this case 'Star Wars,' is a pretty fun thing."